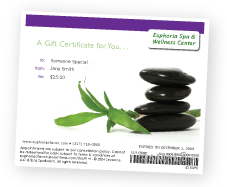 Euphoria Spa & Wellness Center is one-of-a-kind. Located across from Hendricks Power on old U.S. 36, Euphoria opened its doors in 2004, and has since built a strong reputation for offering some of the finest wellness services in the area. From Deep Tissue and Swedish massage, to Couples massage and specialized Prenatal massage for mommies-to-be, Euphoria Spa & Wellness Center delivers only the best in therapeutic massage services for the whole family, plus licensed skincare and waxing services which are second-to-none. And our entire staff shares our vision of providing consistency and quality in all our professional services. In 2007, Euphoria added a women’s specialty “boutique” to its offerings in order to serve the unique needs of breast cancer survivors and others in our community and the surrounding counties. Our mission is to offer each woman the information, services, products and support necessary to help her look and feel her best following breast surgery or other cancer treatments. In the private boutique area, Euphoria specializes in fittings of full and partial breast forms (prostheses), pocketed mastectomy bras, camisoles and swimwear. We can assist women in almost every phase of their breast cancer treatment and recovery, whether a woman’s surgery was 3 months or 20 years ago. A personalized fitting is key in helping a woman restore her natural symmetry. Euphoria’s trained fitters can help select products to meet each woman’s unique needs. The boutique expanded its offerings in 2010 to include wigs, scarves and turbans for those suffering medical hair loss, plus a line of specialized skincare products for patients undergoing cancer treatment or for those with hypersensitive skin. Euphoria is an ABCOP accredited facility, and post-mastectomy products are typically covered by insurance. Medicare, Medicaid, and most private insurance is accepted.